Maybe it was the fact that I had walked 9 miles that day in 90 degree heat, maybe it was the fact that I was deliriously happy to be spending the weekend with one of my best friends who I hadn’t seen in over a year, maybe it was the fact that I was in Rome, but the matriciana and dessert and wine and everything that I ate at enOsteria, a little farm-to-table place near the Spanish Steps, was the best meal I’ve ever had. Even as I was eating it, I was already trying to figure out how I’d make it in my own kitchen. Luckily, we had one of the best waiters of all time and he told us that the secret to the sauce was the orange zest. Genius! To my continual gratitude, he also steered me toward a dessert of strawberries covered in white chocolate mouse with a drizzle of olive oil. It was like a fluffy, sweet and salty cloud of deliciousness. That may need to be my next project. As soon as we returned home from Croatia, S was contemplating the best way to build a rotating spit for lamb and suckling pig in our apartment like the one we saw on the road to Plitvice Lakes National Park. Unfortunately, we’ve had some previous run-ins with the Mainz fire department… and decided that this type of “grill” was bad idea for us. So, we grilled some fish. And made truffle “risotto” with squash. It wasn’t a pig on a spit, but it was pretty good. Earlier this year, I blogged that I’d try out a paleo-ish recipe of S’s and my favorite dish from each of our travels. This month, we’re heading to Normandy for four days, which is kind of near the UK, the origin of the dish that S has been craving, Shepherd’s Pie, so it kind of makes sense that we made it and that I’m blogging about it now…. 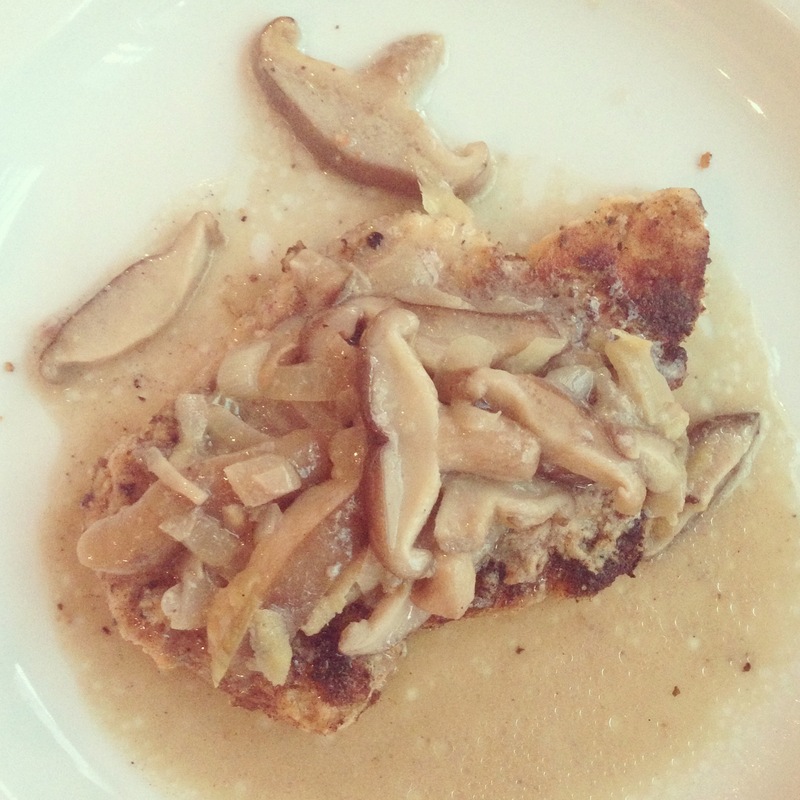 Reasoning aside, we both loved this dish, and so I’m excited to share it with you here. Maybe Germany’s most famous contribution to gastronomy, besides the beverages produced by Augustiner and Hofbrau, which could each easily be a meal in themselves, is schnitzel (or arguably bratwurst because most people think Weiner schnitzel when they think schnitzel and that’s from Austria). Regardless of what most people think when they think German cuisine, the point is that i made paleo schnitzel tonight and would like to share my recipe with you. (Clearly I’m missing practicing law because I’m countering my own points.) Since moving to Germany, I’ve learned that there are many types of schnitzels (and even more types of brats). My favorite type of schnitzel is rahmschnitzle, so I made that (with a twist). I hope you like it!! 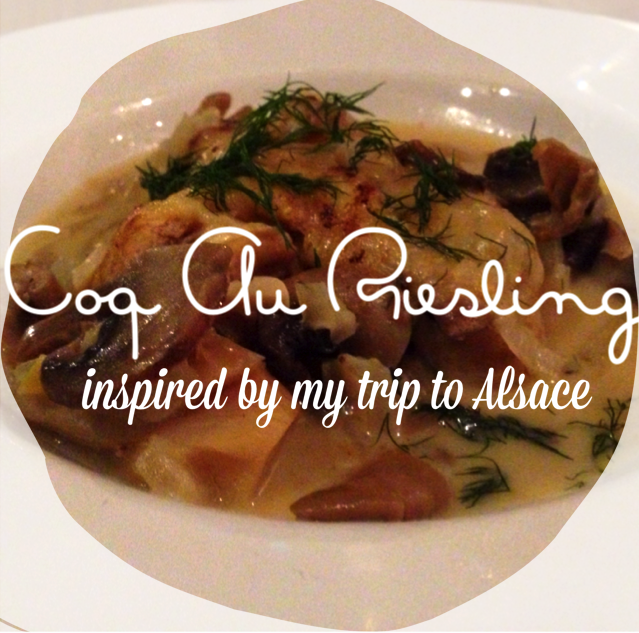 Last weekend, S and I drove out to Ribeauvillé, France, where we tasted local wines, hiked the Vosges Mountains, and, most importantly, ate the most amazing Coq au Riesling. As soon as dinner was over, I immediately (1) felt sad that I didn’t have another bite (or a whole other plate) of it and (2) began thinking of how I could recreate it at home. In my version, I substituted coconut milk with 60% creme for the crème fraîche that is usually called for. I think it turned out pretty deliciously. I even had some this morning for breakfast….